Pizza lovers, Ohio State has the perfect thing for you. The university has unveiled a new ATM machine not for money, but for pizzas. Loaded with roughly 70 pre-made 10-inch pies, the machine is located on the second floor of Morrill Tower on campus. "We are always looking for innovative and new ways to provide services to our students here at Ohio State," Abby Hertzfeld, associate director of operations for the Office of Student Life Dining Services, said in a statement. 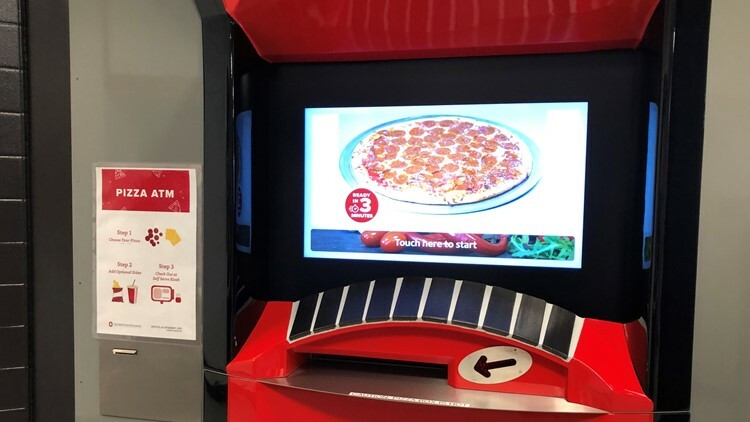 Here's how it works: At a cost of $8, students can select either cheese or pepperoni, and their choice of pizza will be heated up inside the ATM's oven. It will be ready to go in a matter of just three to four minutes. While the machine is currently only open for a total of nine hours a day, Hertzfeld says the plan is for it to become a 24-hour operation. More toppings are also expected in the future. "Students love to eat at all times of the day and even at breakfast they can eat pizza," she said. "They love pizza." This isn't the first time OSU has rolled out a unique food device: Last December, the school debuted a bacon vending machine.